The Government will be launching six land parcels for sale in the second half of this year, including the first hotel site in several years. They comprise four private residential sites, including one executive condominium (EC) site, one "white" site at Pasir Ris Central and one hotel site which can yield 2,705 private residential units (including 695 EC units), 42,200 square metres of gross commercial space and 390 hotel rooms. Another nine sites are placed under the Reserve List inder the Government's Land Sale Programme for H2 2018. These will be triggered for sale if a developer's indicated minimum price in his application is acceptable or there is sufficient market interest in the site. These Reserve List sites comprise seven private residential sites - including one EC site, and two "white" sites. They can yield 5,335 private residential units (including 515 EC units), 82,000 sq m of gross commercial space and 540 hotel rooms. A "white" site is a land parcel where a range of uses are allowed, although the Government is likely to stipulate a minimum component of a specific use or specific uses to meet its planning intentions. 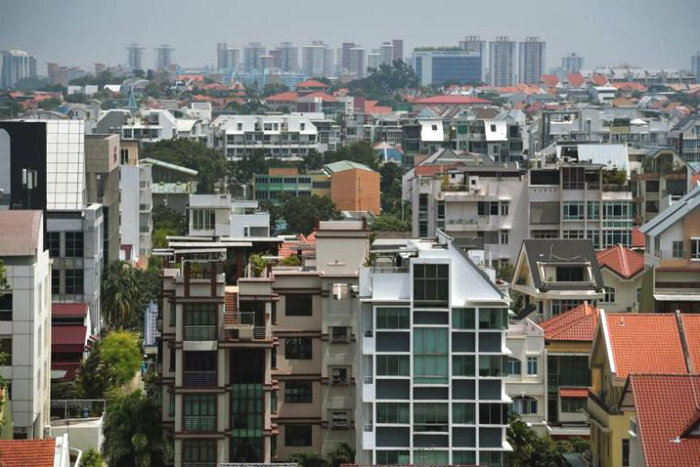 All in, sites under the Confirmed List and Reserve List can yield up to 8,040 private residential units, 124,200 sq m gross floor area (GFA) of commercial space and 930 hotel rooms, the Urban Redevelopment Authority (URA) said on Wednesday (June 27). The residential land supply in H2 2018 GLS thus keeps pace with that in H1 2018 when the government made available 2,775 residential units under the Confirmed List and 5,270 units under the Reserve List. Explaining its rationale, the URA stressed that there is a healthy supply of private housing in the pipeline. Around 20,000 units from GLS and en-bloc sale sites are pending planning approval, on top of the 24,000 unsold units from projects with planning approval. In addition, more than 30,000 existing private housing units remain vacant. "Nevertheless, there continues to be strong demand for land from developers. Transaction volumes are also rising," the URA observed. "Hence, the government has decided to keep the total supply of units for the H2 2018 GLS programme at about the same level as the supply from the H1 2018 GLS programme. Taken together, the total supply in the pipeline will be able to meet homebuyers’ demand over the next one to two years, and to meet our population’s housing needs. "The government will continue to monitor the property market closely and adjust the supply from future GLS programmes, when necessary," the URA added. For commercial land supply, there is a jump in both the Confirmed and Reserved List of H2 2018 - representing a 94 per cent surge in commercial gross floor area (GFA) compared to H1 2018. This includes a "white" site at Woodlands Square/Woodlands Avenue 2 and one at Marina View on the Reserve List of the H2 2018 GLS programme. URA said the Woodlands site will help to sustain the development momentum of Woodlands Regional Centre as a major commercial node outside the city, in line with the government’s objective of decentralising employment centres to bring job opportunities closer to homes. For the first time after several years, the government is also re-introducing hotel rooms supply in its GLS programme amid rosier tourism outlook for Singapore in the next few years. Visitor arrivals and tourism receipts for 2017 hit record highs for the second time in two years. International arrivals increased by 6.2 per cent to 17.4 million last year while tourism receipts rose by 3.9 per cent to $26.8 billion. "With the favourable global economic outlook, the Singapore Tourism Board is optimistic about tourism prospects for Singapore in the next few years," the URA said. 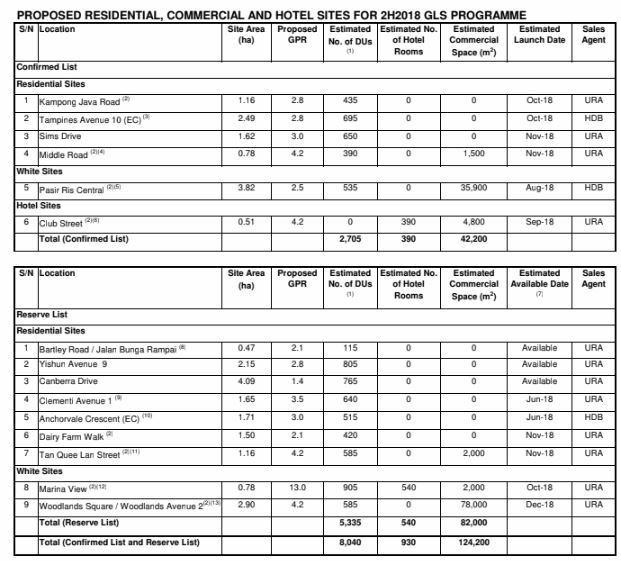 To-date, three Confirmed List sites in H1 2018 GLS programme have been sold and the tender for the remaining three Confirmed List sites will close by September. Two Reserve List sites at Peck Seah Street and Woodlands Square will be removed from H1 2018 Reserve List to facilitate a review of development plans in the area. As a result, a total of seven residential sites remain on the H1 2018 Reserve List and will be carried over to the second-half 2018 GLS programme, the URA said.